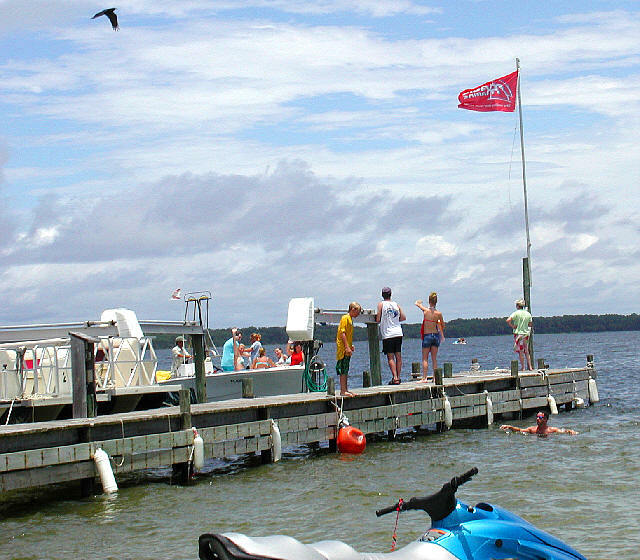 Here is Chapter 3 of our trip to visit John and Marina Brier in Pensacola Florida. 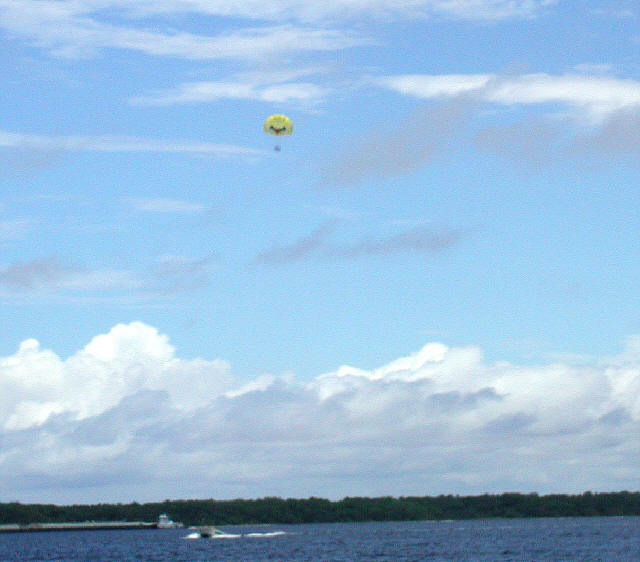 So, anyway, when we arrived at Pensacola Beach, we looked for the Para-Sailing place. We found it, and they had both Para-Sails and Jet-Ski's, or Ski-doos. 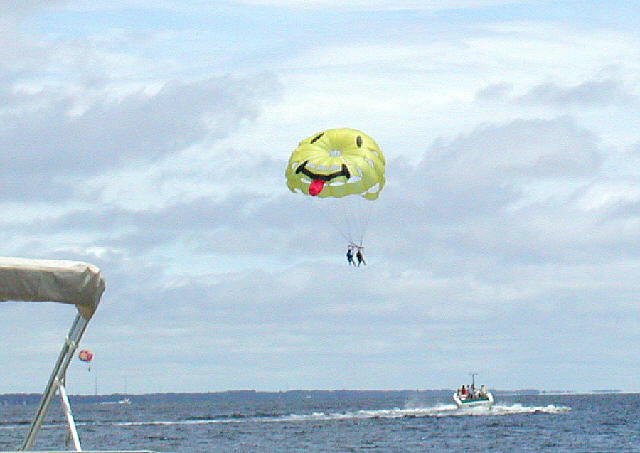 We decided to do the Parasail first (Oh, God!!!) The place for para-sailing was very nice, it had about 20 or so picnic tables along the beach, a restaurant, shower to wash the salt-water and sand off of you, and a pier for the para-sail boats to dock. Here we are getting on the boat. I have the light-blue T-shirt, already on the boat, and Marina is next to me. At the bottom, you can see one of the Ski-Doo's, that we will ride later. The boat takes us out a few hundred yards into the water, then the guide gives both Marina and I a harness and we strap our legs and torso into it. We go and sit on the back of the boat, which has a flat place on it. There is this metal pole thingie sticking up in front of us, about 7 feet high or so (2 meters high), and the rope from the parachute goes through it. The guides toss the parasail into the wind, and it starts flying like a kite, and they reel it in with a winch until it is close to this big pole in front of us. We are still sitting down on the back of the boat. The guides then take the clips on our harnesses and hook them up to another big bar hanging down from the parachute. They say "Are you ready?" but they really don't wait for our answer, the boat pilot shoves the gas forward and the boat shoots forward, and the kite lifts our legs and feet off the boat, and we are flying!!! The view is so beautiful, I cannot even describe it. I was afraid to take my camera up here with me. I wish I had bought a disposable camera to bring, but too late for that now. Our parachute was very silly, it was like a "smiley face" with the tongue sticking out. Higher and higher we go!!!! I am holding on tight!!!! We are like birds now, and we look to see if there are any birds near us :-) We are up almost one-thousand feet high now. If we drop,the impact with the water will kill us for sure. The view is beautiful. Finally, they reel us in. They almost make us dip into the water as they do this - LOL. As we get closer and closer to the boat, they shout for us to "stand up" and we do this, it's very easy. 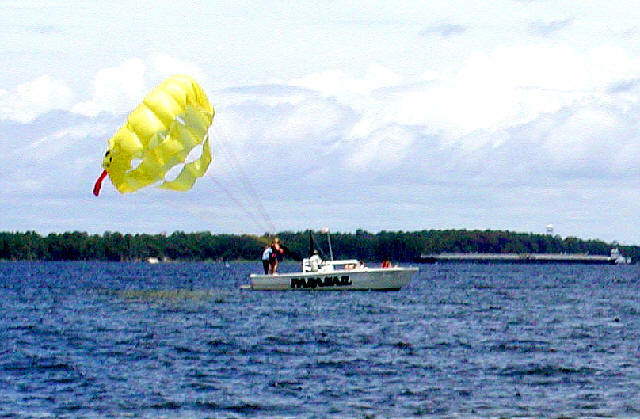 Then, they just winch us down to the back of the boat, the parachute is just like some kind of kite, and we land standing up. Easy! The guides unclip our harness, and we are done. It was too fantastic for words, I can't even tell you! We head back to the dock, safe and sound on solid ground again. Will I ever go back up in a parasail again? ??? YES INDEED, and the next time, I will bring a camera with me! Count on it. OK, now, we have had a great lunch, and it is time to ride the Wave-Runner (the Ski-Doo). Three people can fit on one. We talk about if all three of us (Steve, Marina Capps, and Marina Brier) want to ride each on our own Wave-Runner, or if we want to all three ride on one. We decide to all ride on one. They ask us who will be driving, the driver must have a driver's license. What is this for??? We ain't driving on the road, it's the ocean!!!! Neither of the two Marina's has a driver's license, but I do, and so what? I want both Marina's to drive, so I say nothing, but I make a plan so they can drive the Wave-Runner. Anyway, I give them my driver's license. They take us to the beach again, and show us where we can ride. We have an area of about 3 miles by 5 miles (about 5 by 9 kilometers) we can ride in, marked by bouys and landmarks, etc. It's really very easy to see where we can go. I get in the drivers seat, Marina Capps behind me, and Marina Brier is tail-end-charlie. We set off, and it is FUN!!! We bounce around on the waves, sometimes hard, sometime easy, we zoom so fast you cannot even imagine, and then go slow, we turn so hard you can barely hold on!!!! The G forces are fantastic! I feel the girls behind me holding on to my life-jacket, pulling and clinging so hard they almost make me fall off. Everyone is screaming, mostly the girls, but even me sometimes because it is so much fun!!!! It is like a roller coaster ride, one that just doesn't stop!!!! We go round in circles, making huge waves in the middle of the circle, then zoom right at the huge waves we made and bounce ourselves silly!!! We zoom straight, and as fast as can imagine, ocean spray smashing into our faces, CRASHING into the waves, sometimes we cannot even see, bouncing all the way into the air, hanging on for our dear lives!!! Straight into the shrore we go, then we finally turn away and to out to see again, faster than a bullet! It was too cool!!! Both Marina's are screaming behind me, screaming and laughing, screaming and laughing, we are all having fun!!!!! The air is rushing past our faces like we are in a rocket, salt water smashes into our faces like Tuesday, we are wet all over, laughing, screaming, having fun and zooming so fast that it is like being on a runaway locomtive, and it is so much fun I can't even tell you how good it is. After a while, I decide to let my wife drive. We go about one and half miles out into the ocean (3 kilometers), too far for the people on shore to see, and we struggle to get Marina Capps into the drivers seat, while I struggle to get behind her. This is a hard thing to do on a Wave Runner, they are small and almost want to turn over :-). We wiggle and walk, and the whole thing almost turns over, but finally Marina Capps gets into the drivers seat, and I get behind her, with Marina Brier behind me. So, Marina drives for 10 minutes, and she has so much fun, and she laughs and shouts!!!!!! Next, it is time for Marina Brier to drive. Once again, we are about 3 kilometers out in the ocean, so nobody can see we are switching drivers. Marina Brier takes the drivers spot (after we almost turn over again, it is too funny:-). She drives for 10 minutes, everyone is having so much fun!!!!! Now we switch back -- the girls say "Steve, you are such a good driver, you drive again!!!!" So I do, and we bounce along and smash into the waves, going fast, slow, straight, curvy, fast fast Fast FAST FAST and FASTER, everything that is fun, turning and spinning, it's too cool. All the time, I can feel Marina holding onto me so tight, and then once I feel a HUGE PULL - A REALLY HUGE PULL -- on my lifejacket, and I stop. Marina Capps has fallen off, she is in the water, we go get her, and she laughs as she climbs back on. This was funny, because we could hardly get her up into the Wave-Runner without the thing turning over! Now, we go again, and again and again, speeding over the waves, bouncing so hard and flying into the air again and again and again, really it was like some kind of fantastic roller coaster. Finally, we must go back, and so we do. Even though we were kilometers away, it was not hard to find our place, because there were so many sails there from the sailboats. All we had to do was head for the sails, and we were back home. To "cool off" we swim near the beach, by the pier, and it is very relaxing, this beach had zero waves on it. After a bit, we head to the other side of Pensacola Beach, and there we have the most fantastic waves of the whole trip. These were the waves that were 4, 5, or 6 foot tall, smashing, pulverizing waves, the best kind to body surf, and I am having such a good time!!! The two ladies swim a wile, then go to tan and to hunt for shells, but I stay in the water riding the waves for hours. Finally, they come get me, and I am so beat-up by the pounding of the surf that I can hardly walk to the car. I actually moan and groan, I was truly pummeled by the waves so much so that I had nothing left, it was really hard to even make it to the car. I was so happy, it was such a fun day, these were the best waves!!!! !